The 20 inch E-Series PRO LED light bar is a Combo Pattern light bar and features Spot and Flood hybrid optics to provide the perfect combination of distance and spread. The E-Series PRO was the first projected LED light bar and since it's introduction in 2006, the E-Series PRO light bar has set the standard through continuing advances in technology and superior engineering. 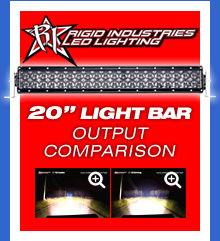 A wide range of uses this LED light bar is the prefeered choice for truck / car applications and vehicle race teams to farming equipment and police / fire rescue vehicles. The E-Series PRO light bar is designed to project light at extreme distances while consuming very little power. Please note; all covers are 10" wide and snap on/off with ease. You will receive the correct number of covers to suit the light bar ordered. Covers are designed to mount side-by-side on 20" and greater light bars.